Wordpress Freelancer Pune - Vicky Verma is one of the best Wordpress Developer in Pune with 7+ of experience in Wordpress custom themes Design & Development, Plugins Customization as per requirement. He has created more than 100+ websites including very complex web-application. Vicky Verma and his Wordpress Freelancer Pune team provide Wordpress services like WordPress Custom themes design, Plugins, SEO, WordPress maintenance services, Digital marketing etc. Be free to contact us for any type of WordPress development services. We assure you to meet your requirements exactly as you stated. My biggest motto is Customer satisfaction and Quality product. WordPress is an online, open source website creation tool. But generally speaking, it’s probably the easiest and most powerful blogging and website content management system (or CMS) in existence today. It is still by far the most used CMS, with 59.4% market share. Also on a daily basis, there are over 500 to 600 websites being created on WordPress. We believe WordPress Development is the future of creating powerful Website. Vicky Verma and his WordPress Freelancer Pune team will provide you with best WordPress Development Services in Pune. 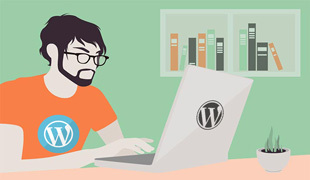 Most of the best freelance WordPress developers in pune has also started following WordPress. The main benefit of WordPress is free to install, deploy, and upgrade. Thousands of plugins and templates power’s a flexible and simple interface, which reduces cost and deployment time. It holds the largest market share in the CMS market. Many users and top freelance WordPress Developers in Pune are already familiar with this CMS due to its rising popularity. And it also requires less staff training when building a new site. WordPress can be self-hosted so there are no cost associated with downloading, installing, and upgrading. There are more than 20,000 WordPress plugins (often free) available to install such as slideshows, contact form, SEO optimization, etc.which can be used by any user or any of the Freelance WordPress developer. Who should use WordPress Development? The must known fact about WordPress is that it is the largest content management platform. Why Choose WordPress Freelancer Pune? Vicky Verma – WordPress Freelancer Pune provides custom development and total customization of WordPress themes based on individual business and website requirements at profitable price. We are team of top freelance WordPress Designers in Pune which sets up WordPress, install theme of your choice and some recommended plugins. Me and my best freelance wordpress developers develop WordPress themes from the scratch or customize any WordPress theme according to clients requirement. Vicky Verma – WordPress Freelancer Pune and his team has worked on all major WordPress theme frameworks like Divi, woo-Commerce. We are mainly focused on high quality of work in time to our clients and exact to their requirement which can be reflected from their feedback to us. Me and my Expert WordPress Developers team can answer all of your questions regarding wordpress development. Please feel free to contact us for any type of requirement. FAQ for WordPress Website Design & Development? Why do I need to develop my website using WordPress? WordPress is huge and has a big community, thousands of free and paid themes/plugins already available, and customization opportunities with personal theme/plugin development. & It is very easy CMS to handle. How long it will take to design my website using WordPress? It usually depends on what type of website you want and the requirements you specify. But generally, it takes 15-20 days to develop a website using WordPress. How to optimize WordPress site to improve the search engine rank? To Improve the search engine rank we need to update the content of the website it helps to improve the rank in google index because Google always shows those websites on the top who’s content is updated. You can pay using either online transfer or through cheque. What wii be the payment steps? You have to pay 40% in advance, later you have to pay 30% after developing the website and the remaining 30% during handover. We are best Wordpress Developers in Pune, Get your website now!